Tonys Photos: Color or Black and White for Street Photography? A couple of weeks ago we posted that Digital Photography School were running a Weekly Photo Challenge on black and white photography, along with a series of tips and techniques on the subject. This is the last of their articles and I can recommend reading it if you are at all interested in the topic. First, let’s assume that you are shooting with a digital camera and the choice of colour or monochrome treatment can be made at the post-processing level. The decision of choosing colour or black and white if you are shooting film is a different story, and requires a different frame of mind, as it is usually made before you leave the house. So, the questions is this: Is street photography better in colour or black and white? There is no right or wrong answer to this question, it is definitely a personal preference. Some photographers only shoot in colour, others prefer black and white for all their work. For my part, I let the subject dictate the choice and that decision is usually made before I press the shutter. Follow this link to read the article in full - Color or Black and White for Street Photography? 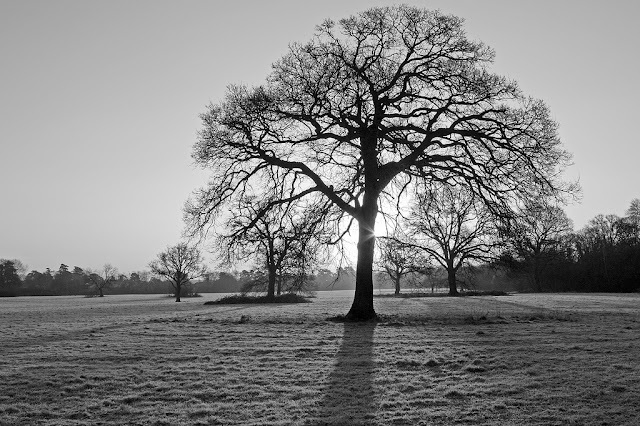 Meanwhile, here is another one of my own black and white images, A frosty Sunday morning on Pinkneys Green Common, Maidenhead.